Creative Campus has a slew of activities planned for students during the March, June, September and November/December holidays. Call us at 6455 3063 for more information. Both current and new students are welcomed! Parents who wish to sign their child(ren) up for the workshop may do so by dropping us an email at chalk@creativecampus.com.sg, filling in our contact ﻿form﻿, or calling us at 64553063. Registration is accepted on a rolling basis until seats are fully taken. Kindly note that seats are only confirmed upon full payment of fees. Payment must be made to confirm your child's seat in the class. Otherwise, the seat will be offered to the next person on the waiting list. Creative Campus has a slew of activities planned for all Primary 1 to 6 students. If you are looking for enrichment activities that will give your children a decisive advantage and help them stay on top of the game, check out what we have to offer this June. Does your child have a love for language and writing? Or perhaps your child is languishing in “exam-type” compositions and would like more help? We have good news. Students in this workshop will delve into the art of composing organised and distinct essays through fun and insightful activities. Guided by experienced gurus who are passionate about sharing our passion and knowledge, your child will learn about the essential skills and techniques needed to excel in the composition component. The Intensive English Boot Camp provides a rigorous practice for both Essay Writing and Comprehension component. Not only will our teachers share the joys and intricacies of narrative, but we will also impart the essential skills and techniques needed to excel in these key components of the English paper. More importantly, your child will learn to develop a personal voice in essay writing. It made writing quite fun and I also have been quite interested in writing during the workshop. I like the workshop as it teaches us how to use different techniques of writing essays. We are pleased to introduce our two-day workshop in June 2019, specifically tailored to the needs of the lower secondary students. Literature can be enjoyable and, with the right approach, easy to grasp. In short, Lit can be fun and a cakewalk! Price: $330 Workshop Fee inclusive of a $50 registration fee. Currents students do not have to pay the registration fee. Registration closes on Monday 11 March 2019. * I am a Published Writer! We are thrilled to announce a slew of March holiday workshops for the Primary students. The P1 and P2 Write-A-Book Project will introduce little ones to the nuances of writing as well as presentation skills. Both the P4 and P5 High Ability Boot Camp and the PSLE Intensive Essay Writing and Oral Workshop are designed to develop your child's personal voice in essay writing, and empower your child’s oral and presentation skills. Last but not least, Speak Your Mind is an in-depth but engaging critical thinking and public speaking workshop for lower secondary students. Guided by experienced English gurus who are passionate about sharing our passion and knowledge, your child will learn about the essential skills and techniques needed to excel in the composition component. Please refer to the table above for details. • Developing content and a sound structure for both narrative and non-narrative composition types. • Varying writing techniques to include scene-setting and characterisation. • Descriptive embellishments to enhance students’ prose. • Introducing verbal skills and strategies that can help to secure better grades in Orals and Presentation. On the last day of the workshops, there will be a summative assessment and a summary of the points covered. Students can then see how the various components are applied to boost their composition scores and oral/presentation skills. Speak Your Mind: a 2-Day in-depth but engaging critical thinking and public speaking workshop. Communication is a vital tool in our intertwining, globalised world, and English, being the most widely used language in the world, is ever more important today. Yet, Singaporeans aren’t necessarily conversant in English, despite it being our primary language of commerce and instruction. We hope to start your child on his journey to speaking confidently, clearly and intelligently. This March holidays, Creative Campus is rolling out 2-day workshops to students in the Lower Secondary. Speak Your Mind aims to fulfil the twin goals of critically analysing the news of today and honing presentation through public speaking. Both current and new students are welcomed!Parents who wish to sign their child(ren) up for the workshop may do so by dropping us an email at chalk@creativecampus.com.sg, filling in this ﻿form﻿, or calling us at 6455 3063. Registration is accepted on a rolling basis until seats are fully taken. Kindly note that seats are only confirmed upon full payment of fees. Payment must reach us before Monday 11 March 2019 to confirm your child's seat in the class. We accept cheque or NETS. As seats are limited, do inform any parent who may also be interested in the workshop! Creative Campus has a slew of activities planned for all Primary School students this year-end school holidays. If you are looking for English enrichment activities that will give your children a decisive advantage and help them stay on top of the game, check out what we have to offer this year-end holidays. 1. How to compose organised and distinct essays. 2. Learn in a fun environment, through engaging activities. 3. Introduction to writing different text types (letter and poetry) through creative role play. 1. Acquire various skills and techniques to personalise narratives for exam purposes. 2. Learn to think critically and excel in the Comprehension component. Answer questions clearly and succinctly. 3. How to be coherent and confident during verbal presentation. 1. Learn the essential skills to deriving original and well-crafted narratives for exam purposes. 2. Learn to identify different question types and apply relevant techniques to ace the Comprehension component. 3. Acquire techniques and skills to maximise marks in Paper 2 [Main Paper] components. In the Celebrating Writing workshops, students will delve into the art of composing organised and distinct essays through fun and engaging activities. Guided by experienced English gurus who are passionate about sharing our passion and knowledge, your child will learn about the essential skills and techniques needed to excel in the composition component. Please refer to the table below for details. The Intensive English Boot Camp provides a rigorous practice for both Essay Writing and Comprehension component. Not only will our teachers share the joys and intricacies of narratives, but we will also impart the essential skills and techniques needed to excel in these key components of the English paper. More importantly, your child will learn to develop a personal voice in essay writing. We understand the demands placed on an IB learner, in particular, the need to work independently even as the deadlines loom and the various assignments battle for the student’s limited time. This year-end holidays, we seek to support the IB student by walking him through the requirements, and essential nuts and bolts, of the all-important Further Oral Activity [FOA]. All IB Year 11 students completing the IB in 2019; Year 12 students are also welcomed. 1. An introduction to the techniques, know-how and skills to fulfil the requirements of a top-grade FOA. 2. Methodical approach to crafting the script for the FOA--what to include and focus on. *Course Details are accurate at the time of printing. Creative Campus: Learning with Latitude has the discretion to make changes to the details and curriculum. Payment of fees can be made via cheque or NETS only. The cheque should be made payable to "Creative Campus: Learning with Latitude Pte Ltd". You may post the cheque to 151A Thomson Road Singapore 307606. Fees should be paid in full by Monday, 27 August 2018. For more information, please enquire at our front desk or call our mainline at 6455 3063. We look forward to welcoming your child! 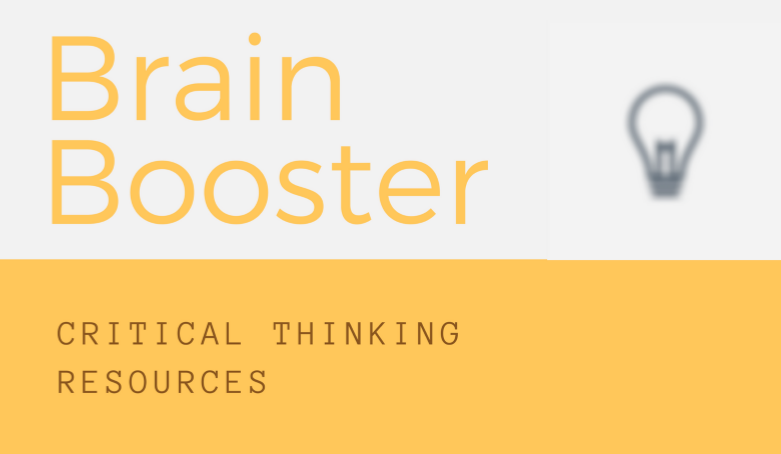 Brain Booster is a free e-publication of news article we have used as bases to springboard critical thinking and analysis with our students. To get a taste of what we do in class, get your complimentary copy of the Brain Booster here!